Welcome to the webpage for VisionScribe Media Services. The company name, VisionScribe, attempts to capture the essence of the business. We want to help you realize and record your vision making it easy to share with others. Our goal is to provide affordable and comprehensive media services, allowing anyones visions to be realized, on a platform that suits their unique needs and within their budget. Whether for broadcast or for home viewing VisionScribe will deliver a quality product you can count on. E-Mail us now to discuss your project. 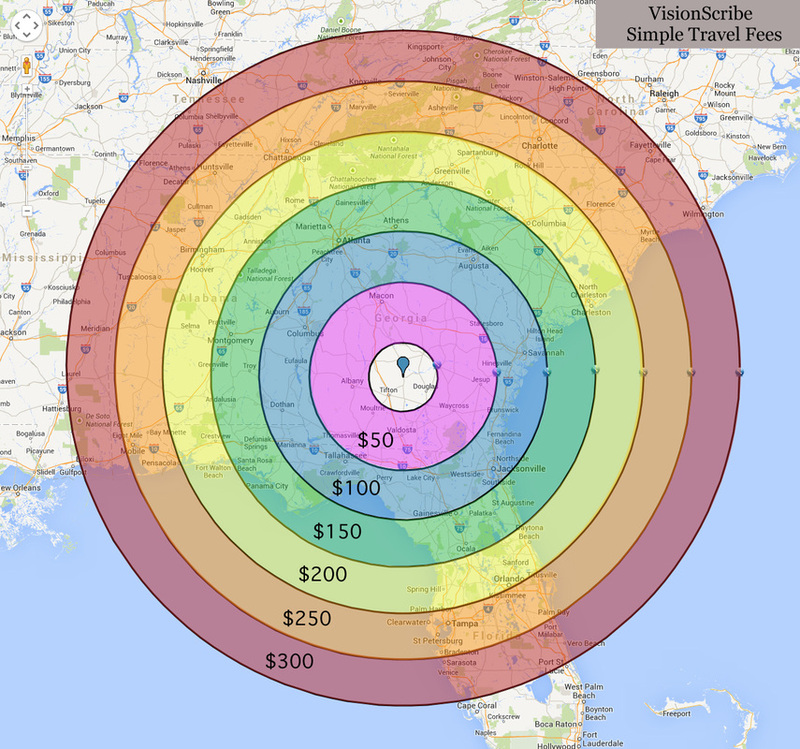 VisionScribe is located in Fitzgerald, GA. Our home provides us a central location to serve the entire Southeast United States. We are just a short drive from many Southeastern cities including Tifton, Albany, Valdosta, Macon, Statesboro, Tallahassee, Jacksonville, Atlanta, Athens and many more. Our travel fees could not be simpler. Just check the map to find how much we charge to come to you. Please view the proof and give comments via phone, email, or use the form on the left. Project contract accepted. Client login emailed with preproduction notes attached. Awaiting confirmation on shoot dates. Production date of 7/1/11 confirmed with client. Preproduction notes are approved and ready for production. Production Successfully competed. Footage reviewed and archived. First preview out to client. Awaiting feedback before proceeding with print.